At that time I was happy to be able to return to a full size shop from the closet I was working in before. Just the chance to set up part of my shop that I had been denied for so long was exciting to me, but in that time I had added new tools and a new skill set, a hand tool skill set if you will. Joining these two worlds together into harmony was not as simple and straightforward as I thought it would be. That should surprise nobody, things are never as simple as you sometimes think they should be. So I have begun the process of sorting through, at least in my mind, and working towards paring down, simplifying, and focusing on woodworking where for the last while I have been focused more on my shop and what I can do to improve it instead of doing the very scary work of putting myself out there with creative furniture. I have started the process. The other day I gave my father my trusty power miter saw, one of the first pieces of woodworking equipment I ever bought. Yes really, when I started I bought two power tools, the miter saw and a small trim router from one of those traveling, tool sale tents. But at the time I was looking more towards the home we were remodeling not towards building furniture.I have started to rethink my shop in many ways and I will be making changes, not rapidly, but slowly, but they will be changes. The first change I have already made, I have committed myself mentally to stop buying tools I do not need, that I cannot justify. I know buying tools is fun and it is exciting. A while back I could not help but pick up a very nice and clean Stanley #6 and a Miller Falls #4 from a flea market for $40. What a buy huh? But when I got them back to the shop there was a little buyers remorse. I didn't really need either of those planes, even though they were an awesome deal. I can use them, don't get me wrong, but I didn't need them. Perhaps there was another woodworker out there, right behind me in the crowd, and he was standing in the shoes I was a couple of years ago, and finding those hand planes would have jump started a whole new chapter in his shop life. I have never believed in the adage "He who dies with the most tools wins" in any other part of my life, it is time to let my shop be more authentic to me and reflect my feelings there. I'm starting to call it The Theory of Tool Relativity, I don't have an equation for it, I'm just not a mathematician, but I do have a distinct feeling for it, when it feels right and when it doesn't. It comes down to simple questions. Do I want to make furniture or do I want to collect tools? Do I want to work in a shop that's well organized with tools I know well that can perform everyday or do I want to work in a shop where I am fighting the losing battle of storage space and work organizers with tools that may or may not hold up ("Oh damn this smoothing plane is dull, let me go grab another") ? Do I want to be my own man and make my own decisions about what tools I need to get projects completed to my standards or do I want to be the puppet of the hundreds of tool makers and sellers out there and purchase the next dozen versions of the lock miter router bit? Do I want to be a tool collector or a woodworker? Do I want to play around of get serious? 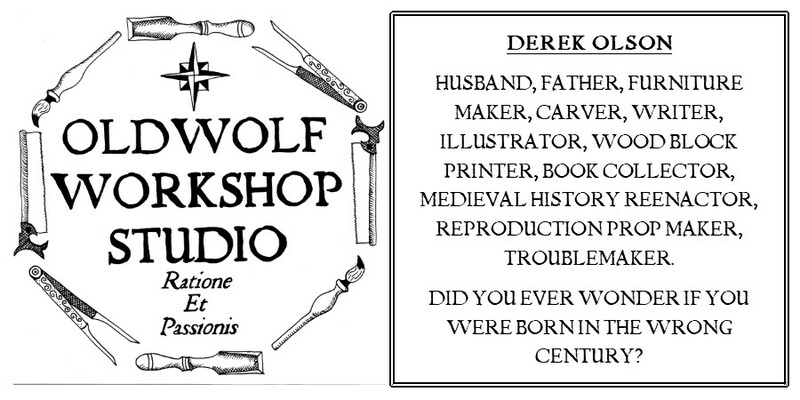 Here's a bit of how my thought process has changed and an outlook on what the future holds for the Oldwolf Workshop. As a lucky member of the email newsletter from Lost Arts Press I was sent the first 2 chapters of the upcoming "The Anarchist's Tool Chest" The first chapter is available for everyone to download HERE, but the second chapter is a little actual meat and potatoes. It is The List, what Chris Schwarz is naming as the essential list of tools a shop needs, period, anything more than what is on this list is extemporaneous fluff. And you know what? For the most part, I couldn't agree more. While I don't own all the tools on the list, I have seriously looked at all the tools on the list over and over knowing that I should have those tools and what do I think has held me back? All those great deals I've found on fixer uppers. If I had saved the money I had spent and instead invested in tools that I know I should have but just seemed too expensive and out of my reach, I'd be further ahead than behind now. So I sat down and developed a plan for my shop, not a rigid plan but one combining the flexibility I need with the focus I desire. First I took the ultimate list of tools from Chris's book and printed it off. Then I spent a good while with a highlighter and a pen going over the list, making notes to myself, thinking my way through the process of what I want as that list. Of course mine is not going to be a carbon copy of Chris's, and I don't think he intended it to be ironclad, besides change comes from thinking it through, not just following it blindly. I eventually separated the list of tools I should have to fulfill whats needed into two columns. A list of tools I should make, and a list of tools I should be buying the best quality possible. I took these papers and I hung them on the bulletin board in the shop to remind me what I'm up to. So among my other summer projects, including a few commissions, I am going to focus on the list of tools to make. I kind of look at it as a check list, there are bigger things I want to focus on with The Oldwolf Workshop, there are bigger ideas in my head, but you cannot put a cart before the horse. and completing this list will set me up to dive head first into those other things. Yes there will be distractions and side trips on the way, but that's part of the journey too. I have been in a heavy period of building things for the shop, understandable really when I step back and look at where I am in the process. I think that this list plus one big thing will complete the journey of readying my shop, for the most part. 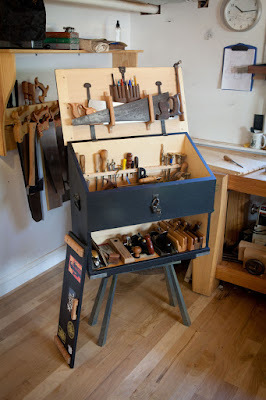 (sometimes I think I'd like to take another crack at a bigger workbench, maybe a Roubo instead of my Nicholson) the final item will be a traditional style tool chest. I know with Chris's new book that this will probably be the "Hot" item to build and blog about this summer and fall, probably for a couple of years so I kind of feel like I'm just a sheep joining the crowd when I build one here, but the truth is this is a project I have been working on and planning for some time and even more seriously in the last year since my Father-In-Law gifted to me the family heirloom of the tool chest that followed his great uncle Melvin over the seas from Norway in the 1860's. (You can check it out for yourself HERE) And I have been promising to make one ever since I received the gift so I can get the old bird out of the shop and into my house like a real family heirloom deserves. I think I may take one other step towards freedom this year as well. I think I may swear off The Schwarz. I will still read what he writes, I will still enjoy all of his blog posts and I will still envy the projects he does, but I have been on quite a kick following his projects lately. From the English Layout Square to the Moxon Twin Screw Vise, from both my workbenches, (Yes the Joinery Bench was inspired by Tim Williams but the info was carried to me by Chris) to my tattoo. He's a hell of a guy, a hell of a woodworker, and a hell of an inspiration, but I need to take a step back and focus on being inspired by his spirit to do more of my own creating and less "follow the bouncing ball"
I imagine his book is going to cause a LOT of this kind of soul searching. I'm there with you, even before that book started being written. What do I WANT to do? Why am I buying tools? etc. Wood planes vs. Steel planes? What era do I want to focus on (a problem you and I share being re-enactors). I'm very much looking forward to the book coming out, and I am going to enjoy the discussion it brings to the hand tool blog-o-sphere. I went through a similar evaluation of my tools when I started rebuilding my shop. It is really easy to get so caught up in the acquisition. I don't think that I will likely buy any more pre-made woodworking tools other than little piddly things like saw blades. The tools that I make myself are much more rewarding. I have been wandering a bit away from woodworking into metalworking and other directions, but honestly, the ethos that I have developed from woodworking has spilled into those equally: Do I need it? Do I buy it? Do I make it? Can I make it with what I already have? Sometimes we need a treat like your new backsaw. Yeah, you could get by without it but sometimes, it is so rewarding to have a nice tool to enjoy. Since it will last several lifetimes, it doesn't really cost that much amortized over the time you will have it and to whomever you pass it on to. My weakness was getting a set of Japanese chisels when I already have an array of chisels that is almost embarrassing. Occasionally, buying is the right answer. I am waiting on the small set of Mujing Feng radius and bullnose planes that I ordered from China. There is no way I could make them for the price. The thing to remember though is that when you look at his list and the lists it is descended from, they are snapshots of a time or place. The spectrum is from when someone was making everything for self sufficiency with limited resources to where things were rigidly divided among craftsman trades. A cabinet maker most likely didn't have a froe. A bodger wouldn't have had a plow plane. Our modern take on woodwork crosses these boundaries so we end up with a different palette of tools in some respects. We have less of some of the really specialized tools since we can't justify the expense and storage since we can rely on modern alternatives. I don't have a cant hook or a pit saw. I just go to the lumberyard and buy dimensioned stock. The last part of the equation is that now we don't have the same support from other trades we once had. We can't drop the table legs off at the turner while we spend our efforts on the joinery. If we want turned legs, we have to turn them. That means we need a lathe, turning tools, calipers, and such. What it really boils down to is careful choice and consideration for our tool set and not just looking at the latest article or such and looking for that magic burffle that will be *the* tool that we have to have to solve all the world's woodworking problems. We have to be guided both by what we are making and how we choose to work. Badger -- I agree focus on an era is tough, taking the reenactment into account can make it all the more interesting. I hope the discussion ranges past the hand tool blogs and into lots of other discussions. The simplifying part is something I have been feeling and thinking about on my own for a while, I think it just took someone like Chris to put it into words. David, you do make some good points, The List is very hand tool centric, obviously considering the source, and I decided not to delve into the power tool side of things when I was working on my notes but try and stay within the fences so to speak. Obviously you are correct about the need for different tools for different skill sets, I didn't even think to worry or include my turning tools in the list and I guess I'm not sure why, even though I think that basic spindle carving should be a skill every woodworker has some familiarity with. Nor did I include any mention of my carving chisels, a skill I enjoy but don't feel that every woodworker should have to know, nor did I include any of my metal working tools, grinders or anvil. for that matter I didn't include anything about the three tool boxes of automotive repair tools I have sitting under a table in the shop either. "Careful choice and consideration" is right on 100%. and I think that for me, that even extends into the realm of tool making, I have to weigh the options of the time it takes to make the tool versus the cost of buying the tool. In many instances making it will win out, but there are things that I know can be done better by someone else, and I have to decide that it is worth my while to purchase it. more exacting items like saws and planes are a good example of this. Consequently one of the first things on the list I plan to tackle is a better bow saw than the mangled pair I made before. I'll finally be putting those pieces you sent me to good use!